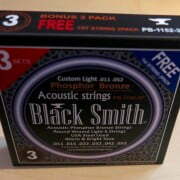 Blacksmith Acoustic Bronze Phospheros Guitar Strings Are Here! Amazing value on Blacksmith Acoustic Bronze Phospheros Guitar Strings @ £19.99 for a 3 set pack & 2 free high E strings & UK delivery included … check them out in the Accessories section now! https://www.themusicdeli.com/wp-content/uploads/sites/18/2016/02/IMG_0700.jpg 2094 2919 steveadmin https://www.themusicdeli.com/wp-content/uploads/sites/18/2015/11/new-logo4.png steveadmin2016-02-16 13:59:062016-10-18 14:17:41Blacksmith Acoustic Bronze Phospheros Guitar Strings Are Here!